ABOVE: Bern and its Marktgasse are only a short ride from Flughafen Bern-Belp by bus or taxi. Most air travelers to Switzerland enter the country via Zürich or Geneva Airport, but the Swiss capital of Bern is another option worth investigating--especially if you're planning to spend most of your time in the Bernese Oberland. Flughafen Bern-Belp is located a few kilometers outside the city, just west of the motorway that leads to Thun and the Oberland. The airport is no Haensli-come-lately to the Swiss aviation scene: It dates back to 1929, and it currently handles several hundred thousand passengers per year. Half a dozen airlines serve the airport, including Lufthansa and a variety of small carriers. Air taxis and other general-aviation services also are available. 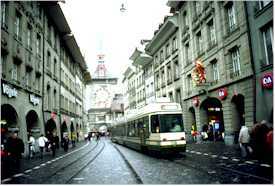 A an airport bus runs between the Flughafen and Bern's main railroad station. During the ski season, a "Winter Bus" will take you to Interlaken-Lauterbrunnen or Grindelwald. S-Bahn trains from several nearby cities stop at Belp's railroad station, where you can catch a No. 160 "Tangento" bus to the airport. The Bern Airport's official Web site is in German, French, and English.